WMSPanel team continues analyzing the state of streaming protocols. November showed a lot of views which means more of interesting content to look at. We expectantly see the increase of HLS share (it's 69% now). The share of RTMP (23%) remains the same while RTSP (4.5%) has decreased. 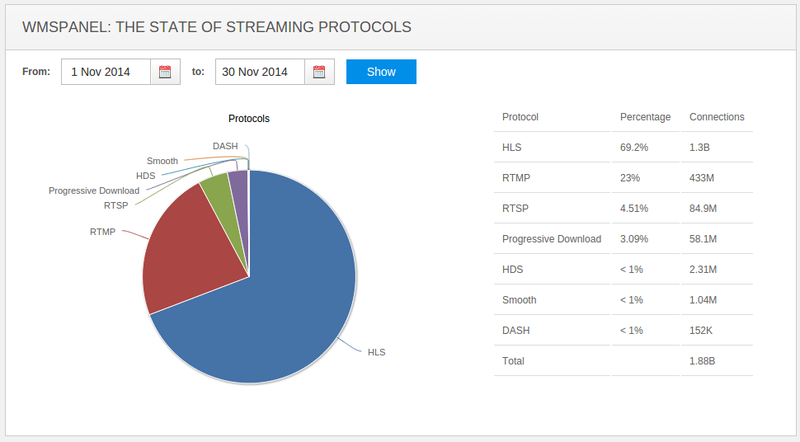 MPEG-DASH is showing a growth still having less than 1% overall. All these metrics calculations are based on 1.88 billion views. Re-streaming of HLS streams from origin via edge server is one of the most popular features of Nimble Streamer. You can use any origin of HLS media and make it available to large number of viewers because Nimble Streamer is very light-weight and fast. So regardless of origin performance, your infrastructure will be able to handle thousands of viewers with minimum investments. You may use secure origins so they have SSL protection for HLS traffic and use HTTPS for their connections. Now Nimble Streamer is able to use SSL to communicate to these origins for HLS re-streaming. The output would be the same as Nimble has now. To make it use SSL, go to Re-streaming setup dialog and click on Use SSL checkbox. for the routes where origin uses HTTPS as shown below. Set up HLS SSL re-streaming for Nimble Streamer. If you'd like to stream the received content via SSL for your viewers, Nimble can do that as well. Read this article for details. Re-streaming is just one of the use cases where Nimble Streamer is used. You can set it up as HLS origin for multi-bitrate live streaming as well as an origin for VOD streaming. It also has RTMP re-publishing feature set which allows setting up efficient live re-streaming across multiple origin-edge servers. If you need more sophisticated protection for HLS, please consider using HLS AES-128 DRM encryption supported by Nimble. Contact us if you have any questions regarding this or other Nimble Streamer features. WMSPanel paywall framework is the foundation for a variety of content protection systems within environment of our customers. It's available for both Nimble Streamer and Wowza Streaming Engine. As Nimble Streamer has Icecast and MPEG2-TS transmuxing capabilities we also made changes to the paywall framework to support that. How you may specify Icecast and MPEG-2 TS in the Links re-publishing protection section. This is primarily used for streams hotlink protection as well as for pay-per-view processing. Protecting HLS, progressive download, Icecast and MPEG-TS against links re-publishing. Nimble Streamer also provides unique capabilities like domain lock and stream-name based protection for your content. Please feel free to install Nimble Streamer to try this and other security-related features in action. If you need any help, check our FAQ first and contact us in case of other questions. Nimble Streamer is created with high performance in mind. Being a native Linux application, Nimble is fast and has low resources consumption. This is why it is chosen for robust high-availability infrastructures and high-speed transmission use cases. So our customers want to learn more about hardware configuration to be best fit for usage with Nimble Streamer. They also want to know what is their existing hardware capable of when using Nimble. The description below covers these and other aspects of Nimble Streamer performance tuning in terms of caching. We will refer to Nimble config and its parameters - it is described in Nimble Streamer configuration article. The most used parameter which influences the streaming process is the amount of RAM available for caching. This amount is used for HLS chunks storage. For each stream, Nimble stores 4 chunks in cache. Once the chunk is out of the playlist, it gets timeout of 45 seconds. So additionally the cache stores several chunks and the number depends on chunk duration. If it's 6 seconds, this would be 4 + 45/6 = 4 + 7 = 11 chunks. For 10 seconds chunks this would be 4 + 45/10 = 4 + 4 = 8 chunks. I.e. for 1Mbps stream with 6 seconds chunks this would be 8.25MB. If you have an ABR HLS streaming with 512Kbps, 1.5Mbps and 2Mbps, with 10 seconds chunks, your cache amount would be around 40MB. Notice that this number does not depend on a number of simultaneous viewers. In addition to cache size you also need to consider the RAM size which your OS will take for network processing. As you can see from this real-life example the OS itself may take a lot more than Nimble Streamer instance. RAM cache size parameter is set up via web UI. VOD streaming also requires cache settings. As in case of live streaming, by default it's located in RAM. In addition, when RAM cache is full, VOD cache starts residing in the file system. So if you're doing VOD, you need to use "Max disk cache size" parameter for setting the maximum size for VOD cache. This is done via web UI. You may also need vod_cache_timeout and vod_cache_min_storage_time parameters in config file for TTL of cached chunks. Please read "Improving cache control for VOD re-streaming" article to learn how to control VOD streaming cache. Let's see some common questions coming from our customers. How many connections can be handled on 2 CPU 512MB RAM server having 1.2Mbps stream with 1Gbps network? 1.2Mbps would require about 10MB of RAM cache. Also, 1Gbps will not require changing worker threads parameter and and 1 extra CPU. So the only limit in this case is the network speed. For given bitrate, the channel will handle 830 connections. Handling 10 streams, 512Kbps each for approximately 10K viewers, what hardware do I need for that? From RAM cache perspective, this will take around 42MB RAM cache. However, 10000 viewers will produce 5.1 Gbps bandwidth (i.e. transmission speed). This would definitely need an additional CPU core (making it 2 CPU cores total) and worker_threads parameter set to "2". The ABR stream has 10 seconds chunks for 240, 360, 480 and 512 Kbps bitrates. What is the cache size for that? Sum of bitrates is 1.6Mbps. 8 chunks, each 10 seconds, divided by 8 will make 16MB of cache size. You can have 10 streams like that and still not get the limit of the cheapest 512MB RAM virtual machine. With average bandwidth of around 400Kbps, your 10Gbps network will allow you to have around 25000 simultaneous connections but that will depend on the popularity of bitrates. You could see how you can improve RAM cache, however there are several other techniques which allow Nimble Streamer to process large amounts of viewers and data. Read our performance tuning guide to learn more about this. Contact us if you have any further questions or need some advise on Nimble Streamer usage. Nimble Streamer is being used in a variety of streaming use cases and scenarios. Many customers use multiple instances for load balancing and robustness purposes. The majority of balancing techniques use geo-location approach or just round-robin balancing to split the incoming requests equally between edges. However this does not guarantee that edge servers will have equal load as some viewers many disconnect from some edges while other edge users will keep watching. So system administrators who use Nimble Streamer need a way to get status of each server to make real-time decisions about which servers should be processing current incoming requests. Usually this means changing the URL of the media streams on the website so any player would pick it up for playback. This is the most reliable way to make balancing happen regardless of the players' implementations. This is why we extended common WMSPanel API by adding a pull API to Nimble Streamer itself. 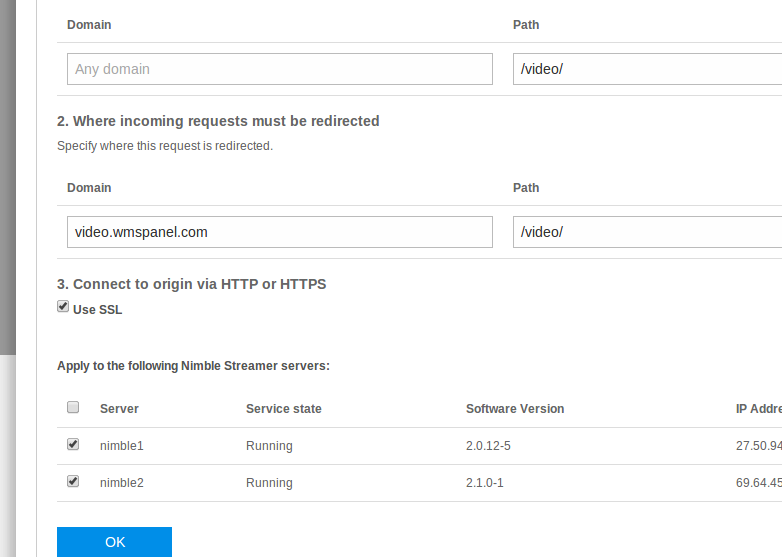 A customer may now launch a request to any Nimble instance and get its status and live streaming settings. This parameter specifies which IP addresses will be used for accepting AI requests. If it's not set, the API requests are not accepted. This is an optional step for the cases when you use management_token parameter for authorizing requests. To make authorized requests you need to make MD5 hash based on the specified token. Please refer to this code sample to see how you can generate this hash. This API method allows getting current number of connection and bandwidth (transmission speed) level. app - name of application; if there are several applications, they will have their separate sections. They are nested under RtmpSettings node. This set of APIs is the first step to building reliable and robust load balancing. If you have any questions or further use cases which you'd like to cover, let us know about it, any feedback is appreciated. Check also a full Nimble Streamer API reference. Update: You may also find useful the Nimble Streamer routes control API and RTMP streaming API which allows controlling Nimble behavior.